Upgrade your game table with a brilliant color, high-quality NCAA game table cloth featuring your team's design. Our durable, high-quality cloth provides an excellent playing surface, allowing you to enjoy your cloth for years to come. 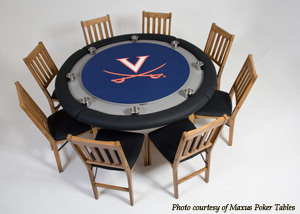 The College Game table cloth is available in one standard size that fits most tables. Custom sizes are available. Please contact us for pricing. --Texas Hold'em cloth size is 48" x 96"